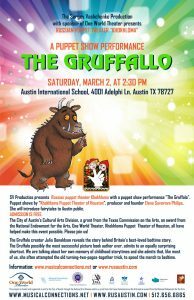 SV Productios presents Russian puppet theater Khokhloma with a puppet show performance "The Gruffalo". Puppet shows by “Hohloma Puppet Theater of Houston”, producer and founder Elena Suvorova Philips. SV Productios presents Russian puppet theater Khokhloma with a puppet show performance “The Gruffalo”. Puppet shows by “Hohloma Puppet Theater of Houston”, producer and founder Elena Suvorova Philips. She will introduce fairytales to Austin public. The City of Austin’s Cultural Arts Division, a grant from the Texas Commission on the Arts, an award from the National Endowment for the Arts, One World Theater, Khokhloma Puppet Theater of Houston, all have helped make this event possible. Please join us! Sponsored by Musical Connections & Russian Speakers’ Society of Austin. The Gruffalo creator Julia Donaldson reveals the story behind Britain’s best-loved bedtime story. The Gruffalo possibly the most successful picture book author ever, admits to an equally surprising shortcut. We are talking about her own memory of childhood storytimes and she admits that, like most of us, she often attempted the old turning-two-pages-together trick, to speed the march to bedtime.